Today we start our Special FREE Draw for Mother’s Day 2013, you simply LIKE Our Facebook Page, LIKE and SHARE our draw post with your friends on Facebook. Enter our draw to be in with a chance to win – Hotel accommodation, full Irish breakfast, Flowers in room and an evening meal for 2. It’s that simple! The winner will be picked at random from those who like and share on Wednesday 06th March. 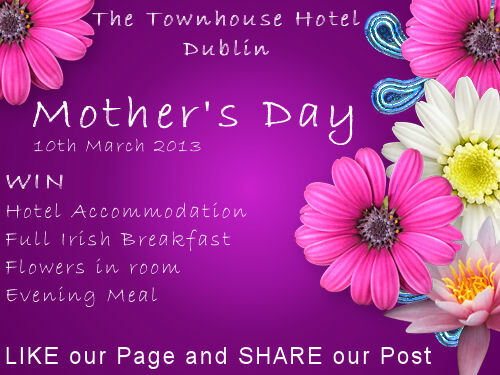 The Town House Hotel would LIKE to say Thank you to all the Mother’s in the world this Special Mother’s Day 2013, in order to put our money where our sentiment is, we are offering a FREE Draw for you to Win a Special treat for Your mother or for a Mother you know, maybe you are now the Mammy, and for that you deserve a treat. All you have to do to enter out Special Mother’s Day Draw is LIKE our Facebook Page and LIKE and Share this Mother’s Day Special Draw. The Prize includes, overnight accommodation for two in the Town House Hotel, FREE Dinner for Two at a highly recommended restaurant, FREE Breakfast and a bunch of flowers on arrival, Happy Mother’s Day 2013 from The Town House Hotel, Dublin, Ireland. Each Mother will have made her own mark on life, sometimes we can be angry with our Mother, sometimes we wish we had not been angry, whatever our relationship with our Mother, one thing is for sure, when she is gone we will miss her. As a famous song says, “A Mother’s Love is a Blessing”, we may not always have felt that way, we certainly did not feel that way when we were not allowed out to the local disco or allowed to stay out after 10pm, but deep down we know that “A Mother’s Love is a Blessing”, who else would have cared enough to sit up waiting until we got home late, who else would have put yogurt in our lunch box. Praying to God to make us well and be ever ready to bear the pain that we may be experiencing. She is the one to wake up early in the morning to make the nicest jam sandwiches and endure all our tantrums. Mothers are the ones who would forever complain that we are not eating enough or not eating right. They would cook all sorts of things so that we are strong and healthy. Mothers in-fact, worry more for our examinations than we must. They would take pains to complete our school projects leaving all other works behind while we play around with friends or just while away time watching movies. Whatever, your relationship was or is with your Mother, please take this Mother’s Day 2013 to say thanks to your Mother, for at least doing the best she could, for being there, and for taking the time to care about us, even when we may not have been as good as we could have been.